One thing that stands out to me is that Harvey was actually skiing slightly faster than Kershaw all day. Of course, the differences are very small (~1 second), but it highlights how large an impact the make-up of your quarterfinal and semifinal can have on your result. 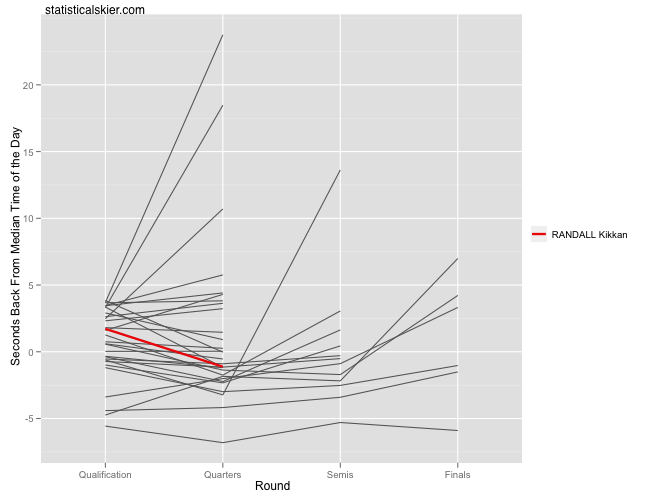 Now, classic sprinting isn’t Randall’s specialty, but you’ll recall that we’ve discussed earlier the notion that qualifying in the top ten is often a good sign for her. Obviously, she didn’t manage that this time around, with predictable results. However, she did mention to FasterSkier that this was one of her better classic sprint qualifying efforts. Naturally, my first thought is to go to the data and see where it stacks up. As far as I can tell, that was Randall’s 5th best classic sprint qualifier out of 27 (WC, OWG, WSC and TdS), as measured by FIS points. Her qualifying time was 4.26% off the pace, which over the past 5 seasons or so would always get you into the elimination rounds of a women’s classic sprint. However, if she wants to be qualifying in the top ten, she’ll need to drop that down to around 2.86%, as 75% of all women’s classic 10th place qualifying times over that time period are worse than that. 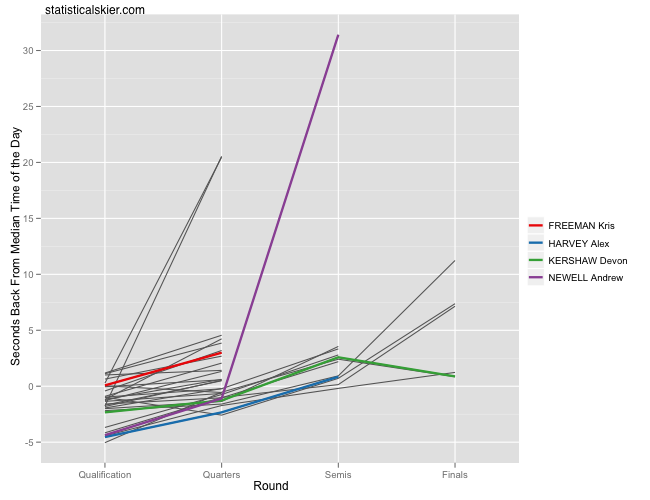 This would correspond to a qualifying effort closer to 34 FIS points, if that scale is more meaningful to you. In a 3 minute sprint race this would mean taking roughly 2.5 seconds off her qualifying time, probably closer to 3 seconds in a longer sprint. It’s kind of weird for me to think about cross-country ski racers sweating that kind of time improvement, and the sort of physiological/training/preparation adjustments needed to accomplish that seem totally foreign to me. I didn’t do much sprinting, though, when I raced. Posted by Joran on Monday, January 3, 2011, at 12:00 pm. Filed under Uncategorized. Tagged alex harvey, andrew newell, classic, devon kershaw, kikkan randall, kris freeman, Sprint, tour de ski, World Cup. Follow any responses to this post with its comments RSS feed. You can post a comment or trackback from your blog.